Because the EPA considers lead a hazardous material, proper disposal of used lead wheel weights is crucial. Wurth USA complies with the EPA-approved disposal methods for you, in addition to supplying collection boxes and return stickers to handle your used wheel weight disposal needs. With the large variety of rims available, you need a supplier that can keep you up-to-date and supply the correct wheel weights when you need them. We offer various different styles of wheel weights in all popular weight increments. 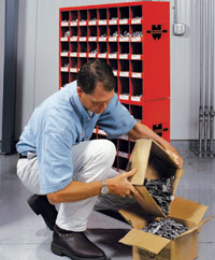 Plus, we organize and label them for easy retrieval and installation.